She Was a Maid. Now She Has a Michelin Star. Home Food She Was a Maid. Now She Has a Michelin Star. Banyen Ruangsantheia holds a tray of Lotus Wraps. North of Bangkok the Chao Phraya River flows more languid and clear than in the city. Mats of water hyacinth bob past a weathered wooden deck where pots of bougainvillea spray blots of pink. Guests chat at scattered tables and chairs in a dining area staff say floods when the river rises each year. Pompoms and streams of ribbons spin in the breeze. At the center of a nearby garden, a large fountain showers a lotus-choked pond before a backdrop of Thai-eaved roofs. This past Friday, there were no pink blooms in the lotus pond. They had already been picked by Banyen Ruangsantheia for her Lotus Wraps. The fusion of place and cuisine are distinctive of Suan Thip, which last week became the first restaurant in neighboring Nonthaburi province to win a Michelin star. At an awards ceremony at an upscale Bangkok hotel, most chefs and owners cheered their achievements. A few others looked overwhelmed by the prospect of a crush of new customers the recognition would bring. Then there was Auntie Banyen. Laughing and appearing a bit confused by all the fanfare, she appeared simply delighted to be there and may go down as one of the award’s most humble recipients. Just weeks earlier, she’d never even heard of the Michelin Guide. “One day a staff member ran to me while I was cooking, telling me that I had to go to the Michelin Star announcement. I was thinking, ‘Why would I go there?’ because I had no idea what a Michelin Star was,” she said. The dishes that won 62-year-old Banyen her star are not buried in any recipe book, but memorized by rote, in part because she is functionally illiterate. Born to poor rural farmers in Korat, she was the third daughter among nine children. She stopped going to school in the fourth grade. To help make ends meet, she started doing heavy farm work at 13 for 10 baht a day. When she was 15, she traveled to Bangkok alone to work as a housemaid for a Chinese family in Yaowarat for monthly pay of 800 baht. The mistress of the house saw that Banyen was a neat cleaner and tidy laundress and told her that the next step was to cook for them. She had little experience. How is it that some normal, folksy dishes got such a high award to be praised internationally? Thus began an education that would, decades later, elevate her to global culinary recognition. “Cooking isn’t easy; it’s hard. And the Chinese family didn’t eat so much gaeng [curry], they had things like tom yum, water mimosa stir-fry and palo [five-spice soup],” she said. Not long after, in 1974, a relative tipped her off that a riverside restaurant in Nonthaburi would be opening. So Banyen hung up her apron to fold jasmine flowers out of cotton for Suan Thip, which wouldn’t become the full-fledged restaurant of today until 1985. At the time, the restaurant was only open intermittently and on a good day pulled in only a couple thousand baht. But the traditional Thai recipes the restaurant called for brought back memories of her mother’s cooking. Coupled with the kitchen know-how she picked up as a maid, Auntie Banyen was soon being asked by the cooks to taste test their curries. With little history of customers, Banyen relied on her memory and grit to rise through the ranks at the restaurant. Banyen would claim a couple of the bubbling curry pots as hers so that she could carefully monitor them, refusing to let others in the kitchen near. When a Michelin taster came to Suan Thip in April – staff there remember it being a farang – he left a card after eating. Banyen was in the kitchen at the time, and the busy restaurant staff forgot to contact the card holder. It wasn’t until a couple weeks later that he called the restaurant and said Banyen should keep Nov. 14 free to pick up her award. “How is it that some normal, folksy dishes got such a high award to be praised internationally?” Banyen said, in a sort of amazed wonderment. 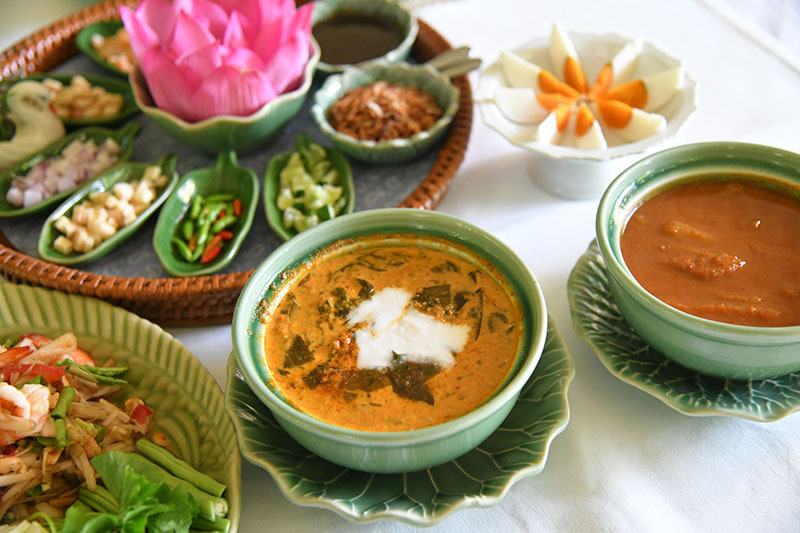 Suan Thip dishes such as the Lotus Wraps, Lotus Root Som Tam, gaeng bon and gaeng kee lek. Suan Thip’s clientele, despite its distance from downtown, includes a large foreign clientele. She suspects that and its popularity as a venue for small weddings and official functions are probably what clued Michelin in to the restaurant. What of the coming storm guide-toting customers who’d never heard of the place until last week? Despite her initial bewilderment, Banyen is happy she can now pass on the kind of very traditional Thai dishes absent from many restaurants to a larger audience. Khaosod and Khaosod English’s interview with Auntie Banyen. In the weeks before and after getting her star, Banyen said she’s had no days off, working from 5am to prepare until closing time at 9pm. Gaeng kee lek, or Siamese cassia curry (260 baht). Suan Thip is set amid a lush garden (“There’s so many trees people think a tiger might jump out!”) with the lotus pond and about 32 tables arranged outdoors by the river, under small pavilions and indoors. One of the outdoor pavilions remains closed since it was heavily damaged by the severe flooding of 2011. In addition to a great view, customers can enjoy relatively low prices as well as the food itself, all Thai and tangy with a spice level to make the proudest native break into a satisfying, sa jai, sweat. The most photogenic dish is the miang kum gleeb bua, or Lotus Wraps (250 baht). A pink lotus blooms in the center of the tray, its puckered stigma intact. Palm a fresh petal and spoon into it some chilies, lime, shallots, peanuts, ginger, toasted coconut, dried shrimp, lotus seeds (also from the pond) and a galangal sauce for a lovely, raw, refreshing starter. Note: Availability depends on the pond’s output. Naam prik Nakhon Ban (325 baht). Unlike most other chili pastes, the Naam prik Nakhon Ban (325 baht) is chunky and full of pork crackling and unfamiliar vegetables like madan and fuzzy eggplant. Restaurant lore says it was based on the personal recipe of ‘70s-era Prime Minister Kukrit Pramoj. Into the chili, dip milkweed flowers (dok kajon), culantro tips, cucumber, white eggplant, winged beans and bitter melon slices for a lesson in edible tropical plants. It’s all sourced from the kitchen’s garden and further educates diners on how well sweat can cool off a spicy burn. Gaeng bon, a curry made from stems of the elephant ear plant (260 baht). Still, the uncontested stars of the newly starred restaurant are the humble chaobaan (country) dishes that are Banyen’s pride: the gaeng kee lek, or Siamese cassia curry, and gaeng bon, a curry made from stems of the elephant ear plant. The gaeng kee lek, which comes paired with crispy-skinned snakehead fish, brims with a coconut creaminess for palates averse to spice or seeking to tame existing mouth-infernos. The gaeng bon’s stems are carefully boiled to the point where the grilled mackerel stewed into the soup seeps in, fortified by an extra punch from salted egg on the side. These two curries (both 260 baht) seem to best summarize Banyen’s decades of cooking. “We cooks shouldn’t be stingy about good ingredients. Use them, and the taste will come out fully,” she said as she launched into the importance of boiling the cassia and grilling the mackerel at the right time. Lotus Root Som Tam (250 baht). The pond isn’t done giving yet. It’s also the source of the som tam lai bua, or Lotus Root Som Tam (250 baht). Not terribly spicy and satisfactory for Thai and foreign tongues, both of which will enjoy the novelty of crispy, fleshy pulp topped with fresh shrimp instead of the usual papaya and dried shrimp. Coconut ice cream (95 baht). The use of quality coconut milk is evident in the first scoop of desserts such as the coconut ice cream (95 baht) and bua loi rice balls in taro and pumpkin flavor (135 baht). Any source of coconut ice cream, whether from a boutique creamery or a pushed cart, is unlikely to hold a candle to that served here, with thoughtfully placed toppings of sugar palm fruits, mock pomegranates and pandan cendol. The bua loi itself are delightfully bouncy, with coconut milk so creamy a born and bred Thai would swear they’ve never tasted gati before, ever. With its weathered deck, pond-sourced food and lovely veteran aunt in the kitchen, Suan Thip’s simple, honest fare and ascension to Michelin status won’t please all the self-proclaimed foodie snobs – but it humbly deserves all the glory it never asked for. Naam prik Nakhon Ban (325 baht) with snakehead fish. Suan Thip is located on Soi Sukhaprachasan 2 in the Pak Kret district of Nonthaburi province. By car, it is about 20 kilometers from BTS Mo Chit and MRT Chatuchak. Alternately, take the MRT Purple Line to the Yaek Nonthaburi 1 station, from which it lies 10 kilometers away by road.